Moscow claims it has informed China about commencement of work on developing a heavy aircraft engine with a thrust of 35 tons for a joint Sino-Russian long-range wide-body aircraft. 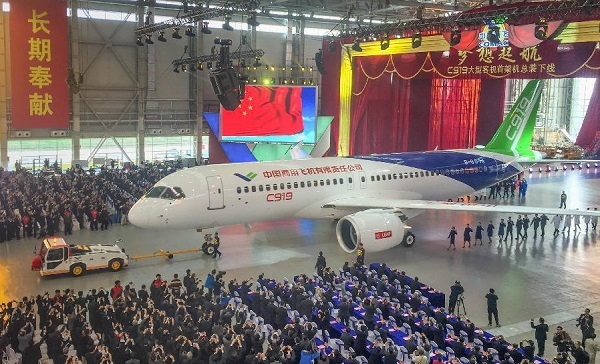 In early 2015, Russian media reports said Russia’s United Aircraft Corporation (UAC) and Commercial Aircraft Corporation of China Ltd (COMAC) began preliminary design of the proposed joint 250-280-seat wide-body airliner. Russian Deputy Prime Minister Dmitry Rogozin told reporters on Monday China and Russia are moving toward joint development of a new jumbo jet that could potentially rival the Airbus and Boeing. “We’ve informed the Chinese side about the beginning of work on Russia’s heavy-lift aircraft engine in the thrust segment of up to 35 tons. The decision was made by the Russian president in May, with all the necessary funds allocated”, Rogozin said after the meeting of the Russian-Chinese intergovernmental commission. A specially-created engineering center in Russia will undertake technical and electronics production while the construction of fuselage and the assembly of the airplanes will take place in China, Rogozin said. In November, China also held talks with Russian state-owned aircraft engine manufacturer United Engine Corp on the possible joint development and production of military engines at the same time it signed a deal to buy 24 Sukhoi Su-35 fighter jets, one of Moscow’s most advanced warplanes. Russian President Vladimir Putin begins a crucial China trip on June 25.